Pace has got to know this route isn't a money maker for them and I just can't see it lasting. Your 714 reference probably is the answer, 722 probably has a grant to build ridership, and if it doesn't build ridership, Pace will ask the communities to kick in. Unlike 714 serving COD (and whitefish) and unlike Streamwood kicking in to save 554, I'm not aware of any community with any interest in 722. When they started 722, I was surprised they made it every 30 minutes throughout the day. This just confirms there is more service than necessary. RTAMS won't load at the moment, but I recall the daily ridership was about 150. From what you said, it sounds like most of them are rush hour riders who have other options anyway. 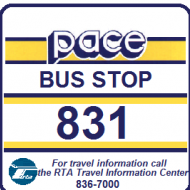 I don't think Pace will cut the entire route just yet, but may reduce service if ridership has plateaued. Have you noticed whether there are any transfers between 722 & 530? Its a start, but usually with grant funded projects (or any new service) would take years to generate. To maybe get 60% of the service class average would be a good performance measurement goal (on ridership/productivity), but at that point, stronger marketing can (and maybe will) help. I'll also preface that by saying that a trip by trip analysis would be needed to see if the concentration is only limited to rush hour or spread across the entire day. Saturday service doesn't look terrible, but at 30 minute intervals can realize that service could be scaled back. (I'll also venture a guess that hourly midday service would probably be helpful too). Its a start, but usually with grant funded projects (or any new service) would take years to generate. Usually (again based on 714) CMAQ provides 3 years. I'm not sure what was used to fund this, but Pace did say it sunk $1 million into the DuPage improvements. I'll also preface that by saying that a trip by trip analysis would be needed to see if the concentration is only limited to rush hour or spread across the entire day. Again, what Pace uses through the ITS data. For instance, when they cut midday service on 240-241, they said there were only 8 riders. Similar thing at the board meeting about 465 that there were so many Ventra taps (half of what was required). Either way, the stats are within the Pace planning dept's possession. Also, on the "should they be serving Warrenville" comment, I'm sure that's no different from when Pace cut certain Barclay Blvd. routings from 272. I can't say for sure if there have been some transfers between the 2 routes. I'll try to watch for this later this week. 722 is usually empty when I've seen it pull into the Naperville Metra Station around 8am and around 5:30pm when I'm usually there whereas 530 usually has at least 1-2 riders, but they mostly transfer to 714, I assume to go to COD. 30 minutes for 722 is way too much, I could see hourly. Ogden avenue is one of dupage county's transit corridors in their public transit plan according to rtams.org. so it appears dupage has a bigger role in this than pace. I would say this route are the seeds for future growth and it will be difficult to cut the route since dupage is behind it. Route should run further east then go north on 83 to oak brook. I would say this route are the seeds for future growth and it will be difficult to cut the route since dupage is behind it. As I mentioned, DuPage was also behind 714, so if the two are analogous, Pace will be coming back to DuPage for more money if ridership doesn't eventually meet standards.